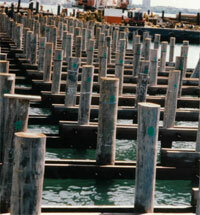 Material for construction of docks, piers, bulkheads, whales, dolphins, locks, etc. The marine industry is our primary focus. With this in mind we have been working to keep up with new developments in the industry, so that we may better serve our customers. This page has been dedicated specifically to marine products in order to make it easier for our customers to locate their required material. If you don't find what you are looking for please contact us. Greenheart - Marine Borer resistant, no treatment required or needed! Ekki / Bongossi - Very durable, no treatment required. We have hard to find items including "Marine Grade" and "Dense Select"
Southern Yellow Pine - untreated, CCA treated, all grades and sizes. Greenheart - used on many large boardwalks, very low maintenance. Ipe / Bethabara - professionals choice for decking, beauty and durability! Ekki / Bongossi - industrial strength, low maintenance, very durable.